Have you ever looked in the mirror, or at a picture and instantly felt sad or dysphoric about how you perceive yourself? If you're trans*, of course you have! I recently discovered this graphic online, and it makes SO MUCH SENSE! However, I believe that some things can't be so easily categorized, and that makes those things so much more powerful because of the potential for it to have an effect on the physical, social and mental self. For example, if you look in the mirror and are hit with negative feelings about yourself. You're seeing how you look physically, which may not line up with what you'd like to see. You may feel social pressure to present or appear differently and mentally because our minds can warp what we see in the mirror and focus on aspects of ourselves that don't give us the full picture. To illustrate this point, I think back to early in Cyndi's transition. She would come out of the bedroom in the morning and look forlorn. I would ask her what was wrong and she would express feeling as though she looked very masculine, or as if "she was never going to pass". This very rarely lined up with what I saw in my wife, and it left me unsure which of us wasn't seeing the full truth. I suspect both of us honestly. She was seeing all her traits that she didn't like, and I generally focus on far more positive traits because I love her. My responses rarely helped her to feel less dysphoric though, as her feelings were reflecting her inner beliefs. I know that I can get this way too. Though for me it's more about pictures than mirrors. (likely because I tend to avoid mirrors, mostly because of their dysphoria risk.) I try very hard to look at a picture of myself without judgement. Depending on the day and my mood at the time, I have varying success at being non-judgmental with myself. So what can be done about this? How does one deal with this issue? I believe that everyone has their own way, and their own coping mechanisms that work for them. One thing that's worked for me is taking the focus off visual cues and focusing more on other senses. I like the way I smell, so I focus on that. I feel validated when I run my fingers across my facial hair stubble, or through my hair. When I am faced with a picture or myself in the mirror, I try to focus on things I do like so that I'm not focusing on negatives. For me that's my ears, shoulders, smile/lips and freckles. 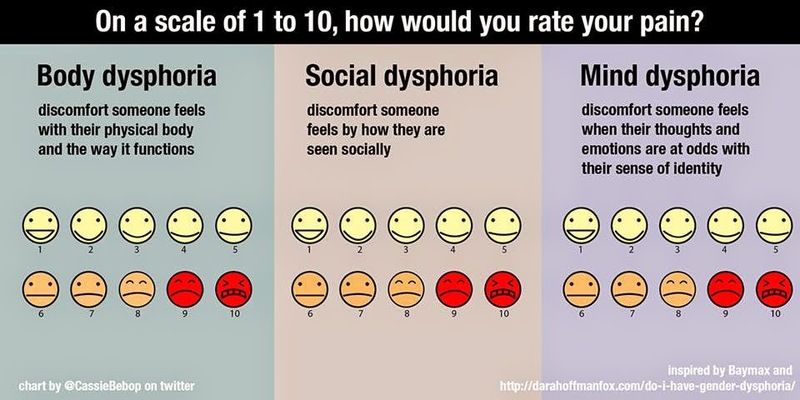 What do you do when you're faced with dysphoria from the mirror or pictures?